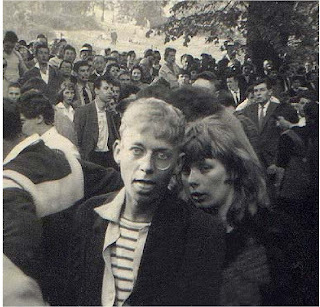 Steve Fletcher has sent this great photo of himself and then girlfriend at a jazz 'rave' on Hampstead Heath in 1955. According to Steve, The Ken Colyer Band played at this event. Ken Colyer was a key figure in the 'New Orleans' infuenced English jazz scene in the 1950s, with regular all nighters at his club at Studio 51 in Great Newport Street, London WC1. The Ken Colyer Club also provided a platform for the emerging British R'n'B scene in the early 1960s, with The Rolling Stones playing there regularly. The 1950s trad and revivalist jazz scenes interest me as a largely unwritten chapter in the history of English youth cultures. Most people assume that it all started with rock'n'roll, but as discussed elsewhere on this site jazz raves were being held from the early 50s. There is something very timeless about this photo - with his stripy top and glasses Steve could have been a member of Orange Juice in the early 1980s or maybe The Long Blondes today. More posts on 1950s jazz raves here.